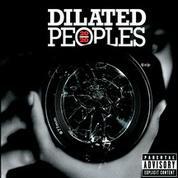 RapReviews.com Feature for February 28, 2006 - Dilated Peoples' "20/20"
Cause many things you fear have been in place for years"
Spin at thirty-three and a third, to make the DJ spin it"
Hard to tell the difference like they fake Louis bags"
The immaculate Dilated Peoples crew"
I might smile, but I ain't no joke"
So - you can't hide, and you can't run"
It's harder to find flaws in the musical performance of "20/20," but tracks like "The Eyes Have It" and "Firepower (The Tables Have to Turn)" stick out like sore thumbs as a result. The construction of the tracks is relatively sound, the production is crisp and clean, and yet neither one can hold a candle to the thumping and innovative "Rapid Transit" or the blood pressure raising pianoes and scratched Large Professor samples of "Satellite Radio." To their credit Dilated Peoples keep the amount of guest appearances on "20/20" to a minimum, the biggest of which being Talib Kweli, and rightly keep that perfect vision focus on their own music. Perhaps the biggest distraction from the sonic dopeness they provide is their own series of skits about a new strain of "20/20" weed more potent than any variety currently known to man. Had these skits been listed as seperate tracks you could easily skip over this complaint would be non-existant, but unfortunately they're tacked onto the ends of various songs seemingly at random. Otherwise it's safe to say that with "20/20" they've created another album that will serve their core audience well. If Ev can step up his lyrical game a little to partner Rakaa's level, while simultaneously keeping his dope self-produced beats in effect, they may eventually find the underground pushing them mainstream without having to give up their credibility. After four straight solid albums it's only a matter of time.